I opened the mail box last week and found a snail mail from Japan 🙂 It’s a belated birthday card!! 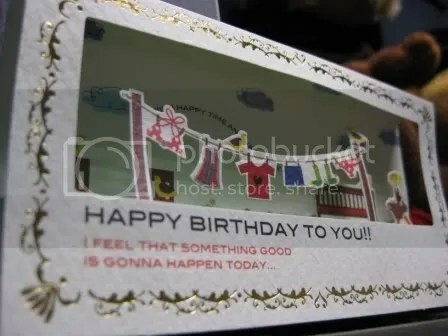 Better yet, it’s a pop-up card … it has to be from Japan, for sure. Cute, right? Thanks, Jules for the card!! I actually like belated wishes, gifts and cards 🙂 That’s because I don’t think 24hours is enough to celebrate a birthday 😛 So belated wishes makes your special day last that much longer.